Telecommunications engineers at the Rochester Institute of Technology have created a new smartphone app that maps cellular coverage areas and measures the actual download speeds of different carriers. 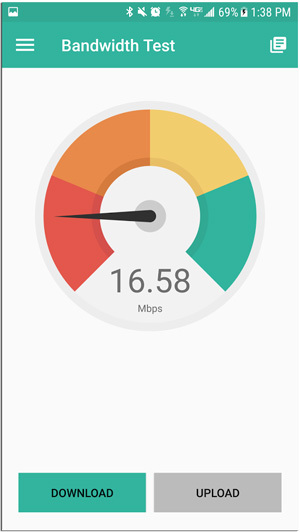 RIT Cellular Metrics, available free through the Google Play store for Android devices, collects background measurements of cellular network speeds twice a day (frequency can be customized by the user) and compares them from location to location and carrier to carrier. "We developed a custom app because we wanted to know exactly which carrier — AT&T, Verizon, Sprint or T-Mobile — had the fastest connection speed at a given location, not just which had faster speed or better coverage on a regional level," said Clark Hochgraf, associate professor of telecommunications engineering technology in RIT's College of Applied Science and Technology and a member of the research team, in a statement. "What we found was quite surprising. The download speeds for two carriers can be very different at one location. And the download speed for the same carrier can vary greatly when you move as little as a few hundred feet away." Security features within the app protect the individual's privacy and identity, Hochgraf added: "Our app doesn't collect any personal information such as SIM card identity or numbers dialed, unlike other apps on the market. We wanted people to be able to make their own measurements and see the coverage maps without having to worry about their privacy." By collecting data across multiple users, the app will be able to map out coverage and connection speeds in more detail, and even predict how connection speeds could change throughout the day, according to a news announcement. The hope is that the information generated by the app could help make carrier network operations more effective, resulting in better service for cellular customers. In addition, the research team is developing a version of the app for emergency response teams, which will enable them to "access network coverage information before going into areas affected by natural disasters or other dangerous situations," the announcement said. The app development team comprised five faculty members from the RIT College of Applied Science and Technology's Department of Electrical, Computer and Telecommunications Engineering Technology: Hochgraf; William Johnson, professor; Yossi Nygate, associate professor; Mark Indelicato, associate professor; and Miguel Bazdresch, assistant professor.